Home › Banking › Chase vs Bank of America Review: Which Is The Best Bank? Chase vs Bank of America Review: Which Is The Best Bank? Chase and Bank of America have almost 10,000 branch offices combined, offer checking and savings accounts, certificates of deposit, over 30,000 ATMs collectively, and easy-to-use mobile banking apps. So how do you choose between Bank of America vs Chase? We examine minimum balance requirements on checking and savings accounts, interest rates paid on deposits, and fees applied to help you decide which bank is best. Regardless of which bank you select, you will enjoy nationwide coverage and customer support. So which bank is best: Chase or Bank of America? During the 2008-9 stock market crash, Bank of America bought Merrill Lynch and added another string to its list of bows: a private client business designed to provide financial advice to customers. Alongside competitive interest rates on savings accounts and certificates of deposit, Bank of America goes a step further than many main street banks and credit unions by helping you to invest for retirement too. The company has become so well run that even Warren Buffett’s Berkshire Hathaway holds a sizable position. But Bank of America has some stiff competition from Chase, which has over 5,000 branch offices, about 10% more than Bank of America, and an equivalent number of ATMs nationwide. Chase also wins high marks for creating one of the best credit cards, the Chase Sapphire Reserve℠ credit card, which is designed for individuals with excellent credit. And Chase has lower account minimums than Bank of America in many categories. When we compare Bank of America vs Chase side-by-side, a clear winner is not obvious at first glance. However, as we look under the hood and scrutinize both companies, a winner appears in each category. Compared to Chase, Bank of America has fewer nationwide branches. Around 4,600 are in its network versus 5,100 under the Chase umbrella. With ever growing banking features available online, branch support may be a lower priority consideration than it used to be some years ago. After all, you can deposit checks via your mobile app these days in as fast as a few seconds, thereby saving a time-consuming trip to the local bank branch. From checking accounts to certificates of deposit, here are the categories where Bank of America comes out on top when compared to Chase. Albeit marginal, Bank of America offers a higher savings rate compared to Chase. The difference is so low that it is virtually meaningless, but nevertheless a win is a win! Where Bank of America savings rates are a good deal more competitive is in the area of certificates of deposit. The annual yield you can earn on 1-year, 3-year, and 5-year certificates of deposit are all more favorable than the equivalent rates at Chase. And to enjoy the more favorable rates you don’t need to deposit more. Both banks require minimum deposit commitments of $1,000. Chase competes with Bank of America when it comes to sign-up bonuses for both checking and savings accounts. The minimum deposit levels on savings accounts are significantly lower at Chase too. Chase also has slightly lower overdraft fees and charges no penalty overdraft protection fees, unlike Bank of America. Chase has a slightly larger network of ATMs nationwide and a slightly better mobile banking app. Chase and Bank of America charge checking and savings account fees, but it is possible to waive both of them. The best ways to waive checking account fees at Chase are to maintain a balance daily above $1,500 or an average balance across accounts of $5,000. When you receive direct deposits of $500 or more monthly, you are eligible for free checking account services too. Similarly, Bank of America waives checking account fees when you maintain a minimum daily balance of $1,500 or receive direct deposits monthly of $250 or more. If you are under the age of 24 or become a Preferred Rewards customer at Bank of America, you are also eligible for no-fee checking. Keep a minimum daily balance of at least $300 or transfer at least $25 monthly from your savings account. You may be eligible for a free savings account if you are under the age of 18 or if you hold a Private Client℠ checking account. The minimum daily balance at Bank of America to waive savings account fees is steeper at $500. You can also link your checking account, though no transfer needs to take place as at Chase. Lastly, if you become a Bank of America Preferred Rewards client you will enjoy a free savings account. Chase and Bank of America have an almost equal number of branch offices nationwide and a similar number of ATMs across the country. Both offer around-the-clock customer support all day every day, and each has intuitive mobile apps for banking on-the-go. Where they diverge is on interest rates, minimum account level requirements, and fees. Bank of America does a better job serving customers in search of higher savings rates. If you are comfortable locking up your money in a certificate of deposit for anywhere from 1 → 5 years, then Bank of America is best. On the other hand, Chase tends to offer better sign-up bonuses for checking and savings accounts, and won’t sting you as much on penalty charges if you happen to make a financial mis-step. You can’t go too far wrong with either bank, but if we had to pick one over the other, Chase wins in more categories and gets the overall nod. 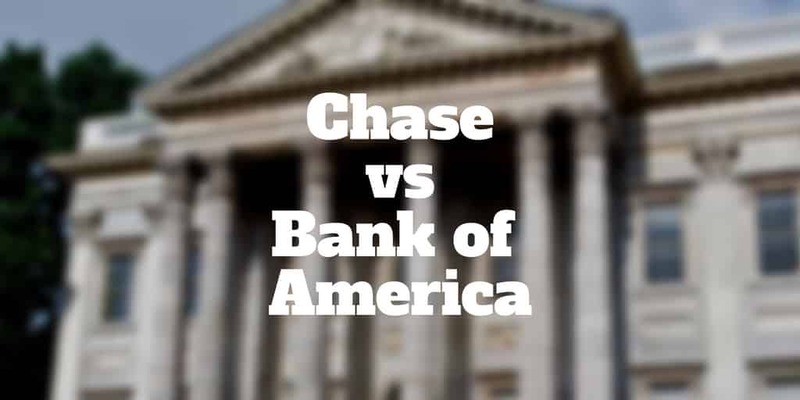 In our Chase Vs Bank of America comparison, did you spot anything else worth mentioning? Tell us if other factors stand out to you, we would love to hear from you. >> Chase Vs Wells Fargo: Which Is The Better Bank?